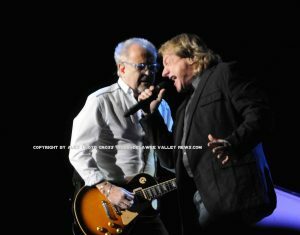 Alex Lloyd Gross- Photo- Delaware Valley News.com Old and new members of Foreigner take care of business. 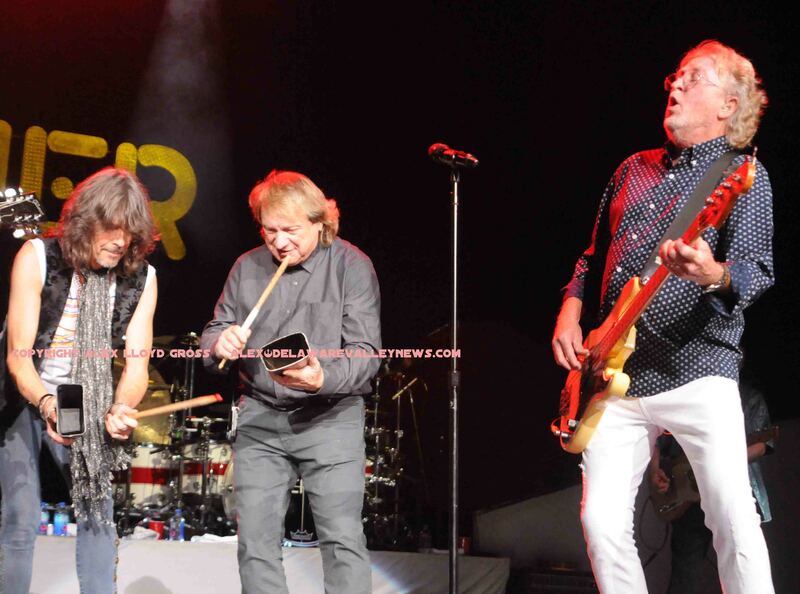 What better place for Foreigner to reunite with Lou Gramm, Ian McDonald , Al Greenwood, Dennis Elliot and Rick Wills, than the Hard Rock Casino in Atlantic City. The band reunites for a few shows, with the current touring lineup. This was an extravagant show that was over way to soon. It was so hot that even the fire alarm was triggered in the arena. These reunion shows are sporadic, and not part of a traditional tour. First up was the current line up. This features Kelly Hansen on lead vocals. The show opener, “Cold As Ice” had Hansen run into the audience to sing. As soon as the band took the stage, it was apparent that something was different. Mick Jones was not on stage. 95 percent of the people who were there, knew that the original members would be there. It was a special treat for the rest. 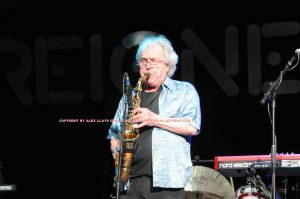 Midway into the show, the original members were brought on stage and belted out songs like “Feels like the First Time” , “Double Vision”, “Long Long Way From Home, which featured Ian McDonald on Sax. This version of Foreigner looks and sounds great. It was all security could do to keep the aisles clear. It was not going to happen. When those songs are played live, by the people that recorded them in the first place, fans of that music want to dance and get a bit closer to the stage. It makes them happy to do it. Security was obliging by allowing them up for a quick photo or two. The Ettess Arena is in the Hard Rock. This is not some hole in the wall club run by people that just go through the motions to be there. It’s a professional concert hall set inside a casino that stresses customer service. The show was way too short. Lots of material was played but tons more could have been played. They need to return and play those songs. Prior to the show, band members were spotted walking around the Hard Rock and very few people recognized them. About an hour before the concert, a few very lucky people got a chance to meet the entire band and get a photo with them.